Kings Island - Part 2: Coney Island Resurrected. Just beyond the Disney-esque International Street area lies a major component of Kings Island (and the reason for half its name—I told you I would get to this), and a special one at that. One might argue that the Coney Island area is the sentimental heart of the park, and it represents a great example of meta-theming—here the classic amusement park of old becomes a theme in and of itself within another park. Vintage postcard, Cincinnati’s Coney Island, 1926. 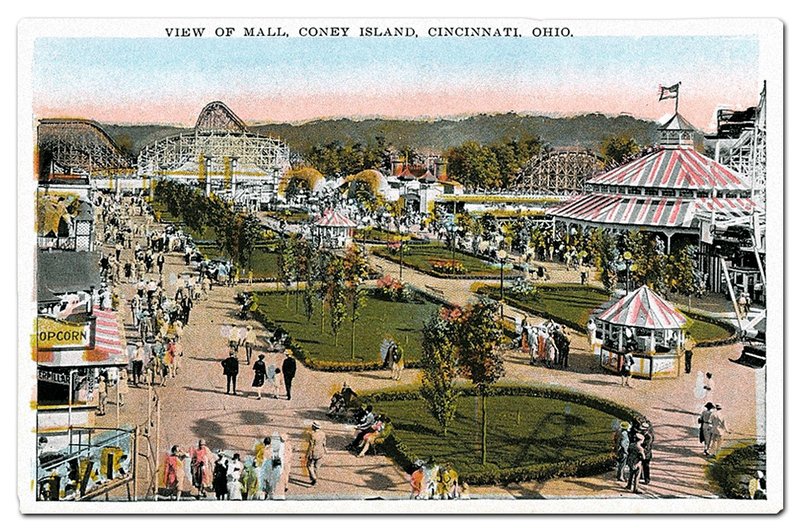 Cincinnati’s "Ohio Grove, The Coney Island of the West" opened in 1886 on the banks of the Ohio river, and was named to capitalize upon New York’s already famous seaside resort and amusement boardwalk; for the second season the park made this even more explicit and shortened its moniker to simply “Coney Island.” The park was popular and seasonal attendance was high. Citizens of Cincinnati and the surrounding area came to view their Coney Island as a much-beloved local institution. Vintage postcard, Cincinnati’s Coney Island. The above postcard perfectly illustrates the park’s strong aesthetic and kinetic link to the New York original, as well as all such early twentieth century amusement parks and boardwalk areas from California and Colorado to the mid-Atlantic Seaboard and Massachusetts. 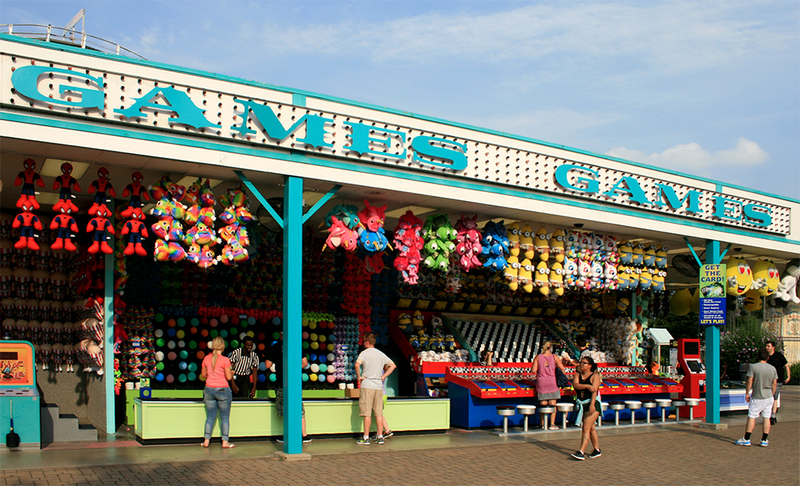 Popcorn and peanuts, wooden roller coasters and balloons, carousels and carnival midway games and cotton candy. You can almost smell it. Cincinnati’s Coney Island underwater, 1968. The problem with Cincinnati’s Coney Island, despite its overwhelming popularity, was its location. The Ohio River was prone to seasonal flooding, and the park was frequently damaged as a result. By the storms of 1968 pictured above, talks were underway to reestablish the park at a new location, still close to the Cincinnati metro area, but far from the unpredictable riverbanks. Vintage postcard, Cincinnati’s Coney Island, mid-to-late sixties. The park was wildly popular with the public, attracting over one million guests in 1970. Obviously Taft Broadcasting, Coney Island’s new owner and the developer of the soon to open Kings Island, couldn’t just shutter the old park and expect people to embrace a new one, sight unseen. So the idea was to honor the park’s 85-year-old legacy and disassemble and move many of Coney Island’s attractions to the new Kings Island—classic flat rides dating back to the 1920s and 30s such as Dodgem, Monster, Scrambler, The Whip, and The Wild Mouse—as well as more recent additions like a Von Roll Sky Ride (1965) and even an Arrow log flume called Race for Your Life (1968) which was the most expensive in the park, constructed for some $500,000, a fortune at the time. The park closed in its original form forever on September 6, 1971. However just two years later, Cincinnati’s Coney Island reopened in a somewhat reduced incarnation, and today it remains a popular water park destination featuring the famous Sunlite Pool, the largest recirculating swimming pool in the world. Coney Island area on Kings Island 1989 souvenir park map poster. When Kings Island finally opened in 1972 after years of development, this area was simply called Coney Island in tribute to the original park. For the 1980 season—and I couldn’t discover why; perhaps a desire for more pointed literalism—the area was renamed Old Coney. In 1986 the name changed again to Coney Mall and has remained that way ever since. The great wooden roller coasters of Cincinnati’s Coney Island did not make the move to the new park and were demolished. However, it was decided to build one from scratch. The flagship attraction of Coney Mall today—and indeed all of Kings Island when it opened—is The Racer, and its place in the history of American roller coasters is legendary. For The Racer is credited by historians as single-handedly sparking the American “Coaster Renaissance” of the 1970s and 80s. In the years between the Depression and the end of the 1960s, countless old amusement parks across the United States and their beloved classic wooden roller coasters, or “woodies,” had been burned, were quietly closed, and/or demolished for redevelopment. Many of these rides were designed by the legendary John C. Allen of Philadelphia Toboggan Coasters (PTC), and in 1964 his Blue Streak opened at Cedar Point and was the first coaster to be built there since before World War II. Seeking to capitalize on the popularity of the Shooting Star (1947) woodie at Cincinnati’s Coney Island, Kings Island literally brought Allen out of retirement to design The Racer, a dual track coaster with a first drop of 88 feet and a top speed of 53 miles per hour (in 1972, this was record-setting). Racing coasters, in which two separate trains run alongside each other, were extremely popular during the 1920s, but none had been built since. The traditional “out and back” layout of The Racer is ridiculously long (some 3,415 feet), so here’s a panorama taken from the observation deck of the park’s Eiffel Tower replica (264 feet in the air). Peering down from that same vantage you can admire the amount of landscaping that the park dedicated to the Coney Island / Old Coney / Coney Mall area. In fact, that was one of the most impressive aspects of the park as a whole—all the trees and bushes were well-kept, and there was shade in abundance almost everywhere. The effect was rather charming (though certainly not on par with Disney). 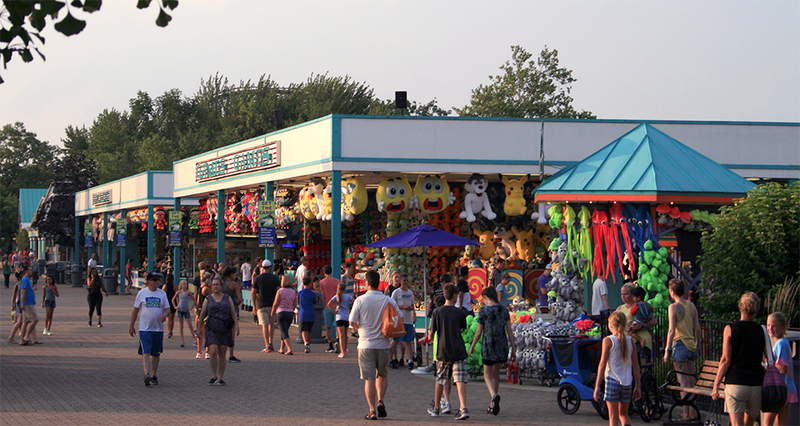 Coney Mall recreates the original midway feeling of Cincinnati’s Coney Island park with a single, wide thoroughfare chocked full of arcades, game booths, and traditional food and beverage concessions. If it wasn’t for people staring intently (and distractedly) at their smartphone screens while paying for softball throws with a credit card swipe, this could be the early twentieth century at any state fair or travelling carnival in the United States. And why did The Racer generate such national interest, leading parks old and new all over the United States to begin building their own coasters at a fantastic rate? Many claim it was actually The Brady Bunch. 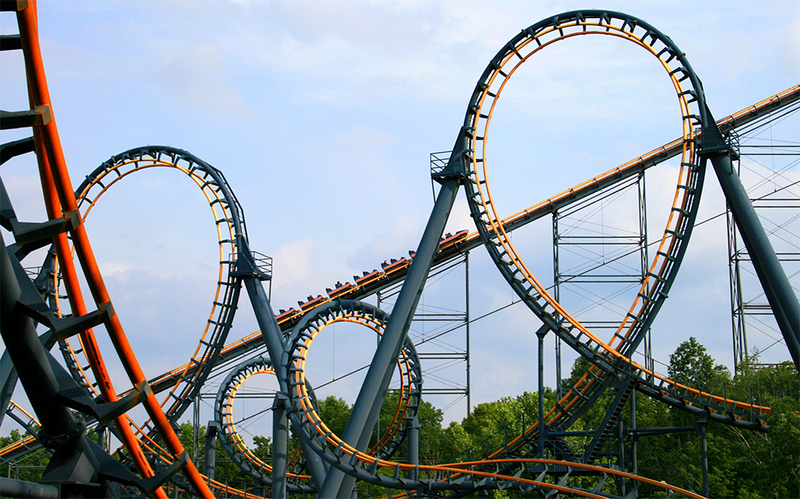 In August of 1973 the popular television sitcom shot an episode at Kings Island, “The Cincinnati Kids,” which aired the following November and featured a family ride on The Racer in a prominent sequence. It would seem nearly everyone in the country saw it, because the park experienced record attendance for the 1974 season as a result. 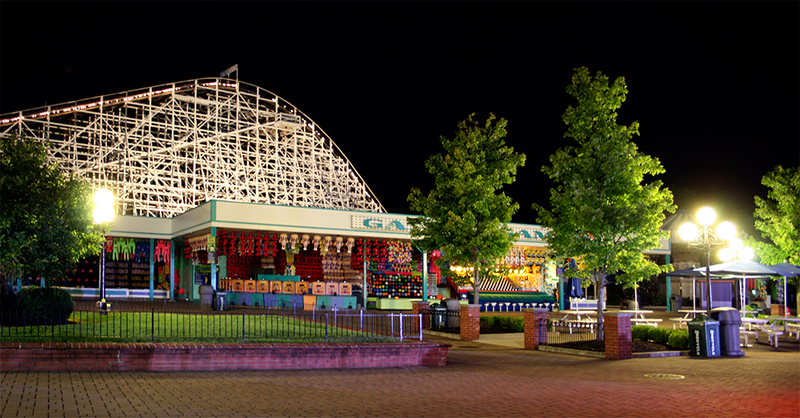 American Coaster Enthusiasts (ACE) was founded in 1978 in the wake of the American amusement park’s second golden age which was begun with the success of The Racer. Even over a decade later, the ride was popular enough to be featured on the cover of the organization’s quarterly publication Rollercoaster! (likely in tribute to the ride’s enormous influence, as there wasn’t even an article about it in that issue). This meta-theming—a nostalgic amusement park within another theme park—was first pioneered at Kings Island, but the trick has since been pulled elsewhere. In 1995, Kennywood near Pittsburgh, Pennsylvania added a Lost Kennywood section to their park. Kennywood has a rich heritage dating back to the 1890s, and was even granted landmark status in 1987 (one of only two amusement parks listed in the National Register of Historic Places). Lost Kennywood, which the park calls “a themed area you’d only find in Kennywood, presenting rides and architecture of days gone by,” faithfully recreates (as much as possible) the look and feel of the original park in the early decades of the twentieth century, complete with majestic fountains and a Shoot-the-Chutes ride called, nostalgically, the Pittsburg Plunge (from 1890–1911 Pittsburgh was spelled without the 'h'). Paradise Pier, Disney California Adventure, 2007. Disney even got into the act when their California Adventure park opened on Disneyland’s former parking lot in February of 2001. An entire land dedicated to the early twentieth century seaside amusement park—some of which like the Santa Cruz Beach Boardwalk and Belmont Park in San Diego, still operate in California today—the Paradise Pier area featured an oversize Ferris wheel-type ride and a coaster called California Screamin’ which was constructed to appear like a classic woodie but was actually made of steel. The supreme (some say disgraceful) irony here is that in developing Disneyland, Walt Disney was reacting against exactly these kinds of parks, which he considered seedy places run by “tough-looking people.” His park would be the anti-Coney Island. Paradise Pier has since been rethemed into Pixar Pier, and California Screamin’ is now home to the characters from The Incredibles (2004), having been redubbed the Incredicoaster in 2018 to coincide with the opening of the film’s sequel. As I observed while visiting Cedar Point, both classic amusement parks and their roller coasters are a distinct form of American visual culture. Wood coasters in particular have an unmistakable form to them (so much so that Disney was inspired to design a modern steel coaster aping a wood structure, down to the smallest details on each and every support). This is the power of the meta-theme, and what makes possible (read: credible) that one type of familiar amusement park—frozen in setting as a particular time and place—can exist as a land within a larger park. Just as with the Old West, no one needs to have any first-hand memories of Cincinnati’s original Coney Island, or any other such amusement park from the early twentieth century, to understand Coney Mall at Kings Island. Basically, Disneyland’s Frontierland and Cedar Point’s Frontier Town work even if you’ve never even seen a Western movie or visited a Western state; it’s just in the American cultural bloodstream. It’s the same reason I can know what Breaking Bad is (and even understand a bit of its premise) without having ever seen a single episode. There is one last bit of design I’d like comment on within Kings Island’s Coney Mall area, and it’s what I call a thematic remnant. The station for Vortex (1987), an Arrow steel looper featuring six inversions, has a Victorian station that’s decidedly gothic in appearance. The building could almost be a haunted house attraction; all that’s missing is a belfry, some fog, and some creepy organ music. For a Reagan-era vintage coaster, Vortex is ridiculously photogenic. The park is well aware of this; there is even a path alongside much of the ride’s footprint clearly intended for picture taking. But the beauty of the ride’s structure, layout, and landscaping isn’t connected to the theme of its station at all. The name Vortex certainly doesn’t help us either. The Bat on Kings Island 1982 souvenir park map poster. But you see, Vortex wasn’t always there. Sitting on this same exact footprint for a very short time (1981–1983 and running intermittently, at that) was a suspended coaster prototype, also developed by Arrow, called The Bat. Original Bat marquee, circa 1982. The ride’s logo was simply delicious, almost belonging on an early eighties Ozzy Osbourne album cover. And considering the appropriately Medieval blackletter typography, suddenly the gothic castle vibe of Vortex’s station makes total sense. The coaster station is a thematic remanent, left over from the previous tenant, The Bat. The disastrous, spectacular failure of this suspended prototype, which Arrow would fix a year later with the debut of The Big Bad Wolf at Busch Gardens Williamsburg, has been well-documented (I recommend this extensive post at the Kings Island official blog if you’re curious about the details). So why was the station left? Quite frankly, the failure of The Bat had cost Arrow and their relationship with Kings Island dearly. They needed to make good on replacing the ride with Vortex, and they had to do so without breaking the bank. The station was neither replaced, nor redesigned, nor rethemed; it was a cost-saving measure. Some of concrete footers which held the steel support columns for The Bat still remain in and around the layout of Vortex to this day like grave markers. Arrow eventually returned to Kings Island with its tenth (and final) perfected suspended coaster model during the years when Paramount owned the park. The ride thus opened as Top Gun (1993) but retained its naval aircraft theme sans-Tom Cruise as Flight Deck (2006) after Cedar Fair bought the property. Given the incredible nostalgia that Cincinnati locals have for their long-vanquished winged mammal, Kings Island made good and rechristened the coaster The Bat for the 2014 season. The ride also received a new paint job reminiscent of its predecessor. Although riders swear it pales in comparison to the original, I really appreciate it when parks honor their history like this. I loved riding The Bat v2.0, but one thing’s for sure—the new logo can’t even hold a candle to the old one. It looks like a sports franchise! The above camcorder footage, a full-circuit POV on The Bat during its April, 1981 grand opening, also includes a vintage television advertisement for the ride, demonstrating its gothic horror theme. Knowing, as I did, a bit of the coaster’s tragic history when I visited Kings Island made discovering the station for Vortex—this thematic remanent, virtually untouched—a delightful surprise. It’s details like this at thematic environments the world over that enhance (for me, at least) the delicate, layered history of these places. I think this rather unremarkable coaster station was perhaps my favorite discovery of all at Kings Island.